Chelsea overcame a resolute Norwich side and an awful Stamford Bridge pitch to move into the FA Cup quarter-finals. The Championship side hit the post through Dickson Etuhu before Shaun Wright-Phillips' deflected half-volley gave the Blues a barely deserved lead. Didier Drogba's neat spin and shot made it 2-0 and Chelsea sealed the win with two injury-time strikes. Michael Essien tapped in the first from close range and fellow sub Andriy Shevchenko's fine header made it 4-0. The scoreline was more than a little harsh on the visitors who were in the game until Essien's late goal. Chelsea owner Roman Abramovich - back watching after a six-game absence - would have been far from impressed as his side struggled early on. Norwich had the worst possible start when goalkeeper David Marshall stumbled awkwardly on the atrocious pitch, twisted his ankle and had to be replaced by Paul Gallacher. But Norwich had started brightly and very nearly took a deserved lead when Etuhu strode through the midfield and hit a low shot which bobbled past Petr Cech only to come back off the inside of the post. Lee Croft looked set to stroke in the rebound but Khaild Boulahrouz did superbly to clear the follow-up. Boulahrouz - back in the side after six weeks out with a knee injury - was soon joining Marshall back in the treatment rooms though after dislocating his shoulder when defending a corner. Championship side Norwich were on top and Chelsea's play was looking a little disjointed. Mikel Jon Obi, Arjen Robben and Wright-Phillips were struggling to get in the game and Norwich, with Etuhu and Darren Huckerby to the fore, were posing problems. Blues skipper John Terry had to react quickly to deny Huckerby a free shot from five yards after a Boulahrouz mis-kick. But with the Canaries beginning to look comfortable and Chelsea far from their best, the Londoners took the lead. Lampard, who had earlier twice been denied by decent parried saves, had a third shot blocked on the edge of the area but the ball broke to Wright-Phillips whose deflected half-volley flashed past Gallacher. And Chelsea effectively sealed the tie minutes into the second half when a Lampard corner rebounded off Chris Brown and back towards goal and Drogba was able to turn and shoot home. The impressive Arjen Robben was a constant threat and wasted several glorious openings while Lampard curled a free-kick narrowly over the bar. But Norwich almost set up a nervy finale with a frantic five-minute spell. Croft was unlucky to see his measured volley canon back off the bar and Jason Shackell had a sharp effort well saved by Cech seconds later. Dion Dublin also tested the Blues keeper with a header but Chelsea doubled the advantage with two injury-time strikes. Essien tapped home the first from close range after a fine run and pull-back from Shevchenko. 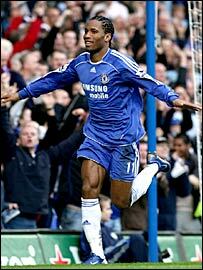 And Shevchenko completed the scoring with a superb header from Salomon Kalou's pinpoint cross. "The result was a bit heavy for Norwich. They played well and gave us a difficult first half. To be fair I think we were a bit lucky to be winning 1-0 at half-time. "In the second half, the second goal gave them no chance to react. After that we had a lot of chances and space and I could rest players and start thinking about the game on Wednesday. "I thought before the game I could give some rest to some players so I left Ricardo Carvalho and Claude Makelele out and put some players on the bench. "The first moment I thought the game was over, I took off Didier Drogba and Frank Lampard." "It was very disappointing but I think the last two goals were down to tired legs. We deserved a lot more. We produced a performance capable of winning. "We had a go at them manfully, especially after losing our goalkeeper, hitting the post and having a shot cleared off the line, you think it is going to be one of those days. "But the boys kept going and showed great attitude. We have to take this into our league form because we want to be playing at places like this week in, week out and the boys have proved they are capable of doing that. "We never got the just rewards for our efforts and general play. The final thing was missing and that was putting the ball in the back of the net and that was down to good goalkeeping at times and bad misses." Chelsea: Cech, Geremi, Boulahrouz (Essien 44), Terry, Ferreira, Diarra, Mikel, Lampard (Shevchenko 69), Robben, Wright-Phillips, Drogba (Kalou 56). Subs Not Used: Hilario, Bridge. Goals: Wright-Phillips 39, Drogba 51, Essien 90, Shevchenko 90. Norwich: Marshall (Gallacher 11), Hughes, Shackell, Dublin, Drury, Croft, Safri, Etuhu (Fotheringham 59), Lappin (Martin 79), Huckerby, Brown. Subs Not Used: Colin, Doherty.